Have You Heard of the Fish Owl? Jeremy Hance has an article at the Guardian on the quest to save from human encroachment a huge — and largely unknown — raptor: Blakiston’s fish owl. “Although an avid birder, Slaght never expected to actually see one of these things. He was told the owl was so rare that even seasoned ornithologists rarely saw it. Yet one day, hiking in the forest with a friend, he had an encounter that changed the course of his life. “He assumed it was a Eurasian eagle owl – which can be found across the entirety of Eurasia, from the coast of Spain to that of Primorye – but took a few photos just in case. “A few weeks later, though, Slaght gets his pictures developed and takes them to a local ornithologist. Read about other places this rare bird is found (including Hokkaido, where it was once considered a god), here. Jonathan Slaght holds a Blakiston’s fish owl in his arms. He is one of a handful of researchers studying this massive raptor, which is threatened by human activity. Heath Hen, Where Art Thou? An old, falling-apart film of a heath hen has been unearthed. Why is that thrilling? 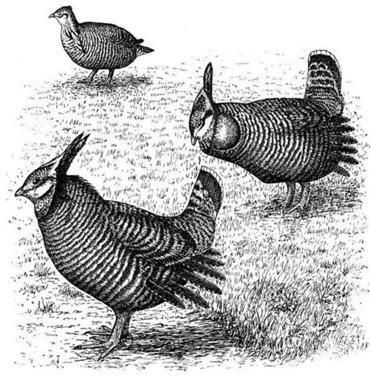 The heath hen is extinct. Writes Carolyn Y. Johnson in the Boston Globe, “The bird stamps its feet on the ground, taking mincing dance steps through the corn stubble. Neck feathers flare like a headdress, and the male puffs out his neck, making a hollow, hooting call that has been lost to history. “These courtship antics are captured on a silent, black-and-white film that is believed to be the only footage of something not seen for nearly a century: the extinct heath hen. “The film, circa 1918, is the birding equivalent of an Elvis sighting, said Wayne Petersen of Mass Audubon — mind-blowing and transfixing to people who care. It will premier Saturday [March 8] at a birding conference in Waltham. “Massachusetts officials commissioned the film nearly a century ago as part of an effort to preserve and study the game bird, once abundant from Southern New Hampshire to Northern Virginia. Then, like the heath hen, the film was largely forgotten. “Jim Cardoza, a retired wildlife biologist who worked for the Division of Fisheries and Wildlife, said that for him, the film holds lessons about how conservation efforts have evolved. Read the rest of the article and watch the film here. I love the idea of a long-rumored, valuable film finally being found. It’s a great story. It’s also an argument for better filing systems. State of Massachusetts woodcut, 1912. The fancier heath hens are males. Have you been reading about Elizabeth Warren, the temporary head of the new Consumer Financial Protection Bureau? People say she is too controversial to be approved by the Senate and that maybe her employee, Raj Date, a former banker, would be a good compromise candidate. Maybe so, but I just want to tell you about the extraordinary consumer advocate that I know Elizabeth Warren to be. As a professor at Harvard Law School and an expert on bankruptcy, she has worked tirelessly to reverse the erosion of the of the middle class and lower-income families that has occurred over the last few decades. The CFPB was really based on her work, and she is the right person for the job. Growing up among a lot of older brothers, she learned to argue for herself and be persuasive. I have sat in meetings and heard her talk about her research and outreach, and my jaw just dropped. She is so passionate, and her arguments are so clear and incisive. She is capable of persuading many others who think they have different positions, because she always can find the common interest. But I think the country needs a consumer advocate who doesn’t back down. Elizabeth Warren has a powerful effect on people. One day several years ago, I was standing in a grocery checkout line and by chance I overheard the cashier telling a customer that when she was thinking of filing for bankruptcy, she contacted Elizabeth Warren and received energetic help — for free. Later she would e-mail Warren anytime and get a response and advice. Probably Warren can’t answer such e-mails now, but I will check with that cashier next time I see her. If Elizabeth Warren hired Raj Date, then he is a good guy. But if he is a real consumer advocate, I don’t see that his chances of being approved by the Senate are any greater than hers. Comments may be sent to suzannesmom@lunaandstella.com. Luna & Stella is apolitical, but Suzanne said I could write about anything that interests me, and that is what I have been doing.